About mid-January, I shared this spread. I know it's hard to see, even with my wonderful new camera, but it's winter and we all have difficulties photographing our art during the drab winter months when the sun is so low in our northern hemisphere sky. The background got me thinking, though. 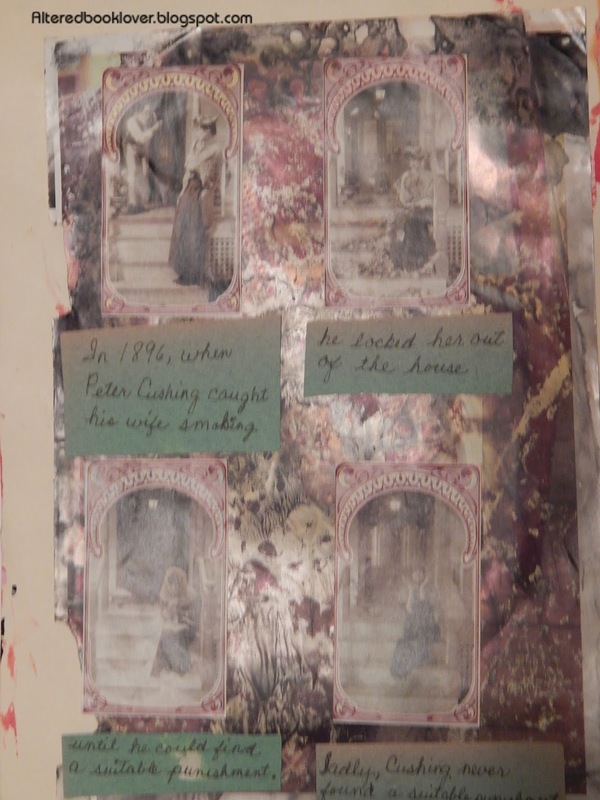 It was one I created using National Geographic pages and turpentine. Gravure printing is used for long run printing where its greater prep costs outweigh the cost of multiple plate changes. The process utilizes a 72-inch wide copper coated metal cylinder which is etched with a pattern of very small square cells of varying depths with a computer controlled diamond stylus. The depth of the cell controls the amount of ink deposited on the paper, and even the type is screened. The etched copper cylinder is then coated with chrome to prevent wear. Most newspapers and cheap magazines contain uncoated paper that has a slightly fibrous surface. National Geographic uses a coated paper that has a smooth clay coating applied over a base paper. 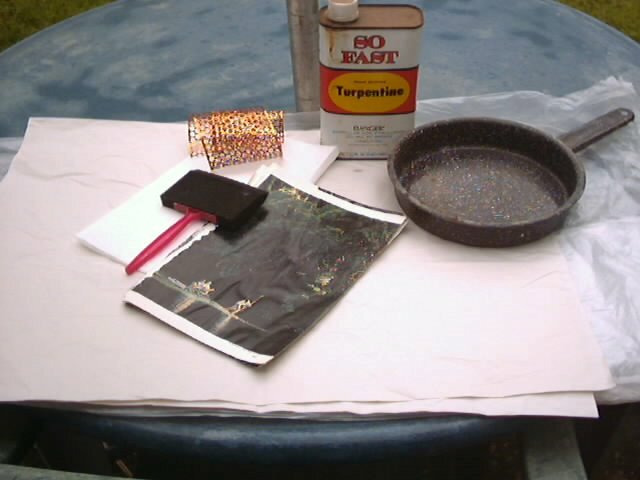 The base paper is made first, then put through a "bath" of clay coating. Alternately, it is coated while running on a metal roller that smooths out the coating on the paper. 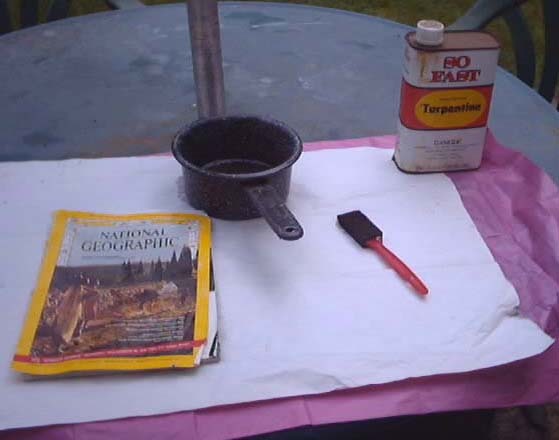 The clay coating is what gives National Geographic the fabulous color photos it produces in each issue, and what allows the turpentine to interact with the coating. 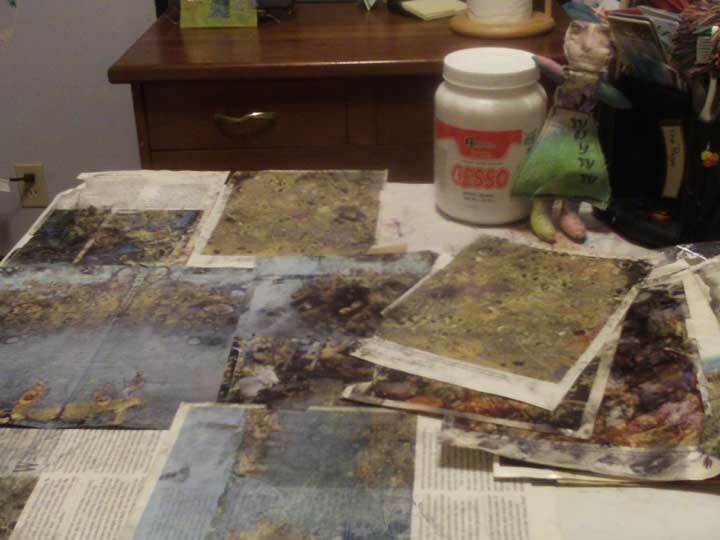 Back in 2008, I made some turpentine papers using National Geographic magazines. I had very little success with the process and was deeply disappointed. I did it again. That time I had marginal success. I had more success with the plate in the photo I was rusting! I was jumping for joy. Sure, they still smell and I mean SMELL, but they are awesome. The good news is, most of the scent will be gone in about a week. If you are sensitive to the scent, be sure to leave them in a place where there is plenty of open air (Ed note: I left them in my garage for at least a week after I took these photos). I truly believe this is how they should have looked the first two times I tried this technique. Just so you know, the top photo is from 2008, the next two are from 2009, and the last ones are from Saturday. 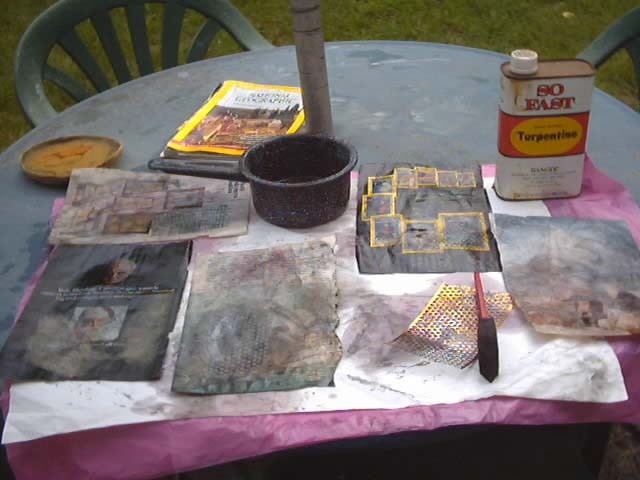 And I used that same can of turpentine, too (free from my Household Hazardous Waste Swap and Shop). Just a few words of advice from what I learned in 2010. 1. Be sure IF you use turpentine, perform this process outside, wear a respirator, and gloves. 2. Pull the pages apart after they have soaked for awhile, but before they have time to stick together. 3. You can also twist the pages as you separate them which will help to mix the colors. 4. Don't expect text to change. The only color you will get on the text is from the opposing page if it has a color print on it. 5. This can be a hit and miss process. 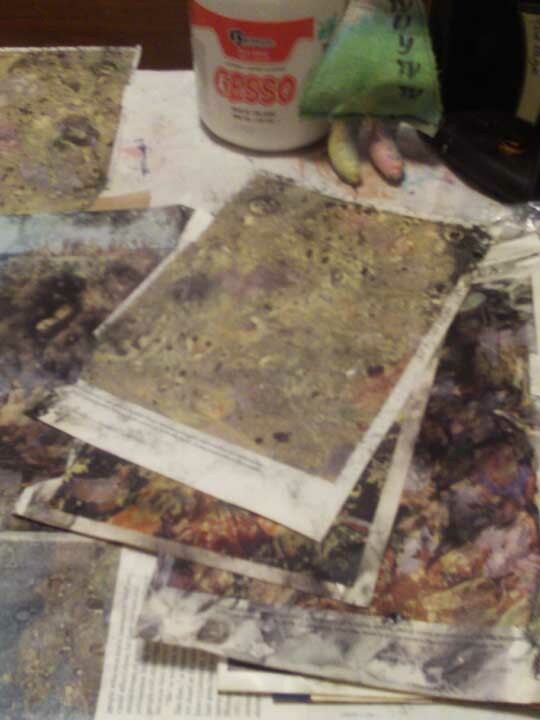 Some pages, even after sitting submerged in the turpentine will not mottle. 6. You can't be stingy with the turpentine. I found the only time I got good results was when I submerged an entire section of the magazine. 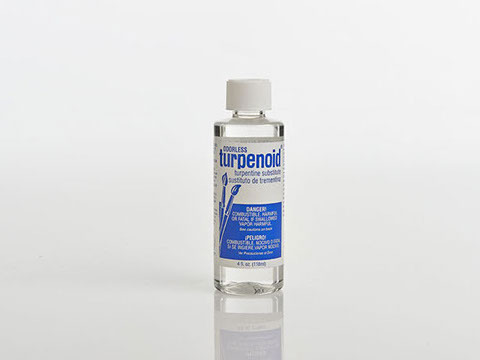 Turpinoid, an odorless turpentine alternative found at craft and art supply stores. Be aware, this tiny 4 oz (118 ml) bottle was over $6.00 (USD) in 2009. 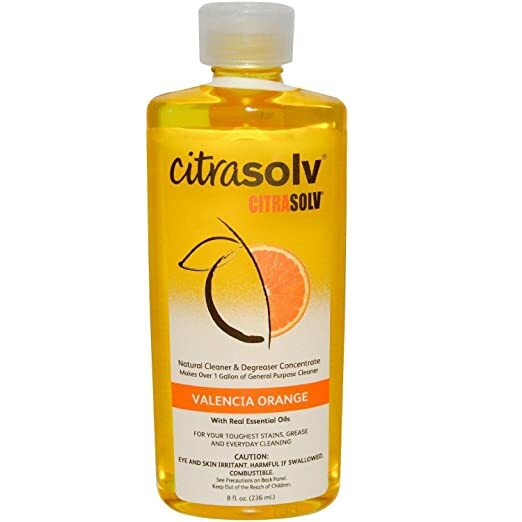 CitraSolv. It costs about $12.00 (USD) for 8 fl oz (236 ml). My friend Halle sent me a bottle this size for my birthday one year. Now it's time to share your Second on the 2nd. The rules are quite simple and everyone is welcome to join the fun look back. All you have to do is bring back a post that you are especially proud of, or perhaps one you shared before anyone knew your blog existed. Any post, any genre, any artistic endeavor is acceptable. Then link below (direct links only, please) and Bleubeard and I, along with other Second on the 2nd friends, will be by to visit. I would also appreciate it if you would link your post back to Second on the 2nd at Altered Book Lover. Please be aware this link is only open for five days, so linking on the 2nd is preferred. Thank you for sharing all your knowledge about this technique(s) - good to see it a second time, in 2010 I was just a stamping-girl and had no idea of Mixed Media.. I can remember that at this time the citrasolve with the national geographic magazine together got popular and we in Austria / Germany - as we got no citrasolve here- used to take Nevr-Dull Wadding Polish or nailpolish remover to make rubbings over different magazine pages to use them as backgrounds for our cards - that was really fun and we enjoyed it ! I have got some "under wonder" meanwhile "Vlieseline" and have now to try out what I want to make..we will see! You are always an inspiration for me Elizabeth, if I have a problem with the under wonder I will go and ask you - Mrs. Mixed Media Queen of techniques! Happy Second on the 2nd Elizabeth! I think this is amazing and forgot to try it--naughty me. All the free mags at the large food stores have wonderful surfaces on the pages and they are so colourful so I really must have a go at this. This was a great tutorial and I found the information about the paper and printing very interesting. You got some interesting pages in the end of your experiment. Elizabeth, what you have discovered from the various trials is interesting. The pages look fabulous. Thanks for sharing alternatives to turpentine. I love your piece. Poor Mrs. Cushing just wanted a smoke:) Maybe the Mr. knew about lung cancer. Thanks for the story behind the National Geographic paper. No wonder why their paper is so substantial and the images so lush. I've never done transfers with turpentine. So, the idea is to get a marbled look from the pages? That would definitely be an outdoor sport, here. Thanks for the tutorial. Wow! This gives an amazing appearance to the pages Elizabeth! I don't think it is for me as we have nowhere outside here - only the balcony and we like to open the doors on sunny days even in Winter. Wow, what a fabulous technique, so glad you persevered with it and got such amazing results. Just my kind of thing - a little bit random! Another great tutorial, Elizabeth, and so good that you can repeat it due to your own idea for the 2nd of the month challenge. I've said it before but it is useful to read about the not-working parts as well as the working parts. I believe the National Geographic is the very best, if not the only, magazine for this technique. 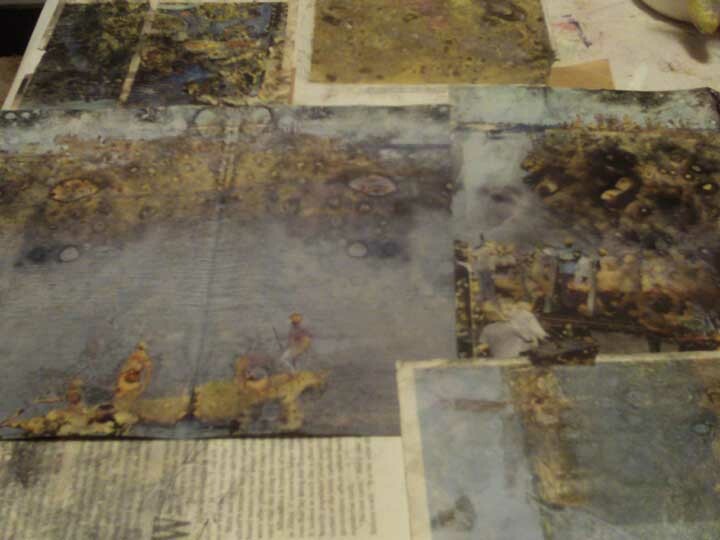 How fascinating to read how the pages are made, and in fact I use a clay-coated plain paper to print my cards, and have found it gives the best results. Thanks very much for your message (comment) on my blog on Tuesday. I could say exactly the same to you. Wow, that was very interesting. I love the look of those last NG pages. Well done you for trying just one more time. Yes, that stuff smells! And it is also good to remember it is highly flammable of course. Sorry for being late. I have just come back from Holland (came home late last night). We are staying at the cave house for one night, as it is on the way home and I will go home home later today.